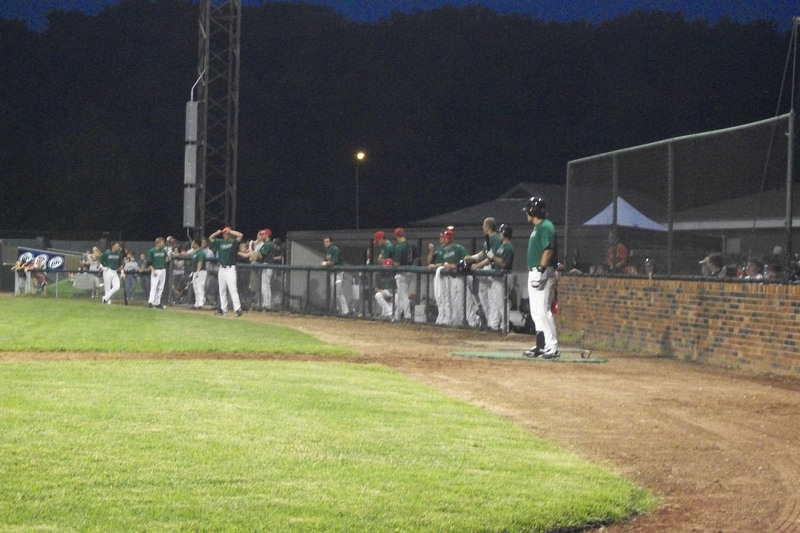 The St. Joe Mustangs took the field with an 8-2 record on the June 11th game against the Nevada Griffons. Both of the Mustangs losses have come at the hands of Nevada. The Mustangs would go on to win 8-3 and even their season series against the Griffons to 2-2 and improve their overall record to 9-2. The attendance for the game was a season high 3176. Center fielder Cameron Bentley impressed with a 4-4 performance with 2 runs scored. Brent Seifert was at third for the first home game I have attended this year. He looks to have slimmed down since last year and was almost physically unrecognizable. Seifert would drive in a run on a RBI triple early in the game. Starting pitcher Jayson Huett would pitch into the 7th inning and leave to a nice ovation from a big crowd after a solid performance. He pitched 6 2/3 innings while scattering 7 hits and 2 runs and striking out 6. It was fitting that Huett would get the start on Saturday. It was “Bearcat Night” in honor of Northwest Missouri State University, the college that Huett attends. The Mustangs donned green jerseys that were auctioned off at a silent auction during the game. The team also wore red hats in honor of Scott Bostwick, the Northwest football coach that recently passed away before ever getting to coach his first game for the team as a Head Coach. Bostwick had been the defensive coordinator for the past several years and always wore a red hat on the sidelines so his players on the field could easily see him in the crowd of green on the Northwest sideline. The Mustangs wearing green in honor of "Bearcat Night."